• You need a small quantity - minimum quantity as low as 5. This way you only order what you need, rather than a huge number to get the best price. • Have an unusual shape - with digital printing there are no plates involved so there are no die charges or set up fees. Any size, any shape, any design. • Need precise, high quality printing. You can really see the difference in detail and color. • Require a fast turnaround - 5 day turnaround or less. Our corrugated plastic signs have a number of advantages over traditional aluminum and poster board signs. Corrugated Plastic is lightweight yet extremely durable. Fluting creates a sign that is exceptionally sturdy as well. Corrugated plastic signs can be placed in a wide variety of outdoor locations. Frames make the installation of corrugated signs easy. If bent, they don't leave a permanent crease and they cost less! Durable vinyl banners have a double folded, double stitched hem and include ropes and grommets. Digitally Printed Custom vinyl banners are available in many sizes and unlimited colors. Suitable for indoor or outdoor use, our banners are a colorful way to promote your message at special events or for grabbing attention for your promotional message. Business card magnets are ideal for realtors, insurance agents, service companies, sports teams and more. Artwork design servicess and quotes are free of charge on all business card magnets. We can create a design for you or use your artwork or logo to create a business card magnet that will have staying power. Promote your company or display your school spirit all over town! Magnetic Car Signs can turn personal vehicles into company vehicles and are suitable for temporary or long-term identification. Design your own business card in full-color using vivid color photographs or artwork. Stand out from the crowd with full-color business cards! ALSO, match your business cards to our digital printed envelopes and letterhead for a complete look. Create a personal card for your other business ventures, enterprises, hobbies. 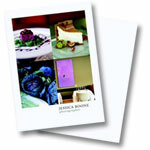 With a 4" x 6" Post card you can express who you are outside of your primary business. Turn your favorite photo or image into a deck of full color playing cards. Cards can be customized with a photo, business logo, text, school logo or mascot, holiday designs, favorite musician, sports team logo or sports figure, and much more. If you want an image on a deck of cards we can do it. 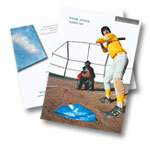 Custom printed note pads and memo pads are a great way to get your message across. Note pads can be custom imprinted with your logo or information. Elite Design specializes in Short Run Digital Printing. If you do not see something you need or need a quote on an item use our contact form to send us an email and we will reply back promptly.